Was your home constructed with a large driveway or circular parking area in front of your home? You may need the space your current concrete or asphalt roundabout provides you for parking and getting in and out of your driveway. However, these parking spaces or parking lots are many times the first thing you or your guests see when they approach your house. The cars are often the focal point, not the house or landscaping. The roundabout is many times situated in the perfect spot for the sunny garden you desire. This can be the constant view from the house instead of the beautiful fountain, trees, and the gardens that it could be. Homeowners can chose to dig up driveways totally and start over. Or they can decide to change the asphalt or concrete roundabout to something more natural such as stone or brick pavers. A massive asphalt or concrete circular driveway replaced with two circles of brick or stone pavers will soften the driveway. A garden space can be created by installing brick or stone walkways for walking through it and will make it much more inviting. It can also provide another place for entertaining or greeting guests with the backdrop of the water’s sound from a fountain. installing a fountain in the middle of the driveway’s circular roundaboutwould provide a focal point and some vertical interest. A boxwood hedge around the perimeter of the inner circle would draw the eye from the driveway to the fountain and provide some definition to the circle. This area could be divided into four boxwood edged planting beds divided by brick or stone walkways. 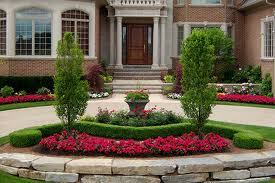 Planting annuals, perennials, or roses would create a garden in the four boxwood edged spaces. The outer circle on the other side of the bricked driveway could have low planting beds defined by natural edgings like pachysandra or a continuation of the stone or brick. The addition of brick or stone paving, a fountain and some garden space can turn a flat landscape into a welcoming entrance to a home. 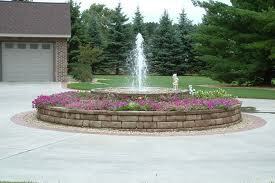 If you’ve got a large driveway or parking area outside your home, the landscaping possibilities are almost endless. A professional landscape designer can help you transform that “parking lot” into a useful yet attractive feature for your home.